The world of baitcast fishing has long been reserved for anglers of a higher skill level. Although there’s a learning curve associated with this style, when broken down into digestible pieces, it becomes significantly easier. One of the first pieces of gear you should consider is the line. This article will walk you through some of the best baitcasting lines on the market. This simple, no-frills line is the old faithful of fishing products. It’s a popular choice among many anglers because of its affordability. Monofilament is also very elastic and flexible, which can be a pro or con depending on your preferences. The flexibility of the line makes it super easy to untangle and knot. Unlike monofilament, braided line is characterized by its little-to-no stretch. This stiffness makes the line super strong and durable, a great characteristic for those hunting for trophy fish. Braided line is a little more difficult to handle, so learning to tie strong knots with the line is definitely a process. This line combines the positive aspects of the aforementioned lines but comes at a steeper price point. It is sensitive, durable, and light-refracting, which makes it nearly invisible in water. The first feature of a line you should look at is the strength, which is often labeled in pounds. A 50-pound line, for example, should be able to handle 50 pounds of pressure from a fish before it breaks. Baitcasting reels are made to handle heavier line, so you’ll want to go for something that is 10 pounds or above. You’ll also want to match the line to your reel’s weight capacity. Braided and fluorocarbon lines have more of a learning curve associated with them. If you are a true beginner, you may want to stick to monofilament lines, as they’re extremely easy to use and very inexpensive. Whereas for the more advanced, a stronger line would probably be a more effective choice. There are so many lines available, and many are specific to a species of fish. Knowing the color that your desired fish species would be most unbothered by is also helpful. Offering lines of every shape, color, and style, KastKind is a popular, trusted brand in the angling world. Something notable about this company is their commitment to affordability, which keeps their products accessible to all. This particular braided line was designed with durability and distance casting in mind. The Superpower line is created with the same fibers that are used in bulletproof vests (Ultra High Molecular Weight Polyethylene), KastKing’s signature “MultiTuf” material. It features eight individual strands, braided together to create a single, strong line. It comes in several colors, including pink, yellow, blue, and multicolor. Sizes range from 10-pound to 65-pound. Another feature of this line is KastKing’s advertised “strong knot strength.” Braided line is notoriously tough to tie knots with, but this particular line has a smaller diameter, which makes it a little easier and leaves extra space on the reel. Other features include added abrasion resistance and low memory for smooth casting. While this isn’t the greatest line color-wise, it does perform very well in other areas. This is a valuable option for any saltwater angler who needs a durable line that can withstand cast after cast. The quality of the materials really shines through in this product, and it’s an added plus that it comes at such an affordable price. 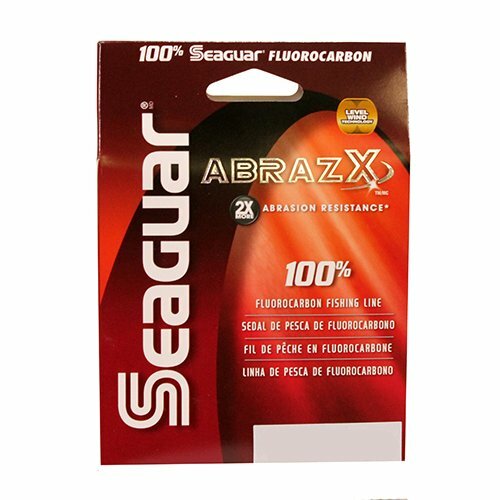 Named “Abrazx” to showcase its abrasion-resistance, this fluorocarbon line from Seaguar can withstand almost anything. While most lines would split, nick, or fray up against rocky, sharp underwater structures, Abrazx holds its own. The line comes in a wide range of sizes, starting with a 4-pound and shooting all the way up to a 25-pound. It only comes in one “color,” which isn’t actually a color at all, as it’s light refracting, which makes it look virtually invisible when in the water. It’s made with 100 percent Seaguar resins, which gives it its durability and strength. Many anglers praise this line for its low memory, which allows it to cast as smooth as butter. The design of Abrazx is fairly versatile, as Seaguar created it to be resistant to UV damage, chemical damage, and temperature issues. It’s also non-absorbant and high density. This line is also made with “Levelwind” technology, which is Seaguar’s process of spooling the line to avoid overstress and twisting. The Abrazx from Seaguar is a super tough line that’s great for rough conditions. If you’re used to line that snaps under pressure, this line would be a welcome relief, as it is incredibly abrasion-resistant and strong. With this strength comes a couple of undesirable qualities, as the stiffness makes it hard to tie knots with and tangle-prone. But overall, this is a great choice for bait casters. 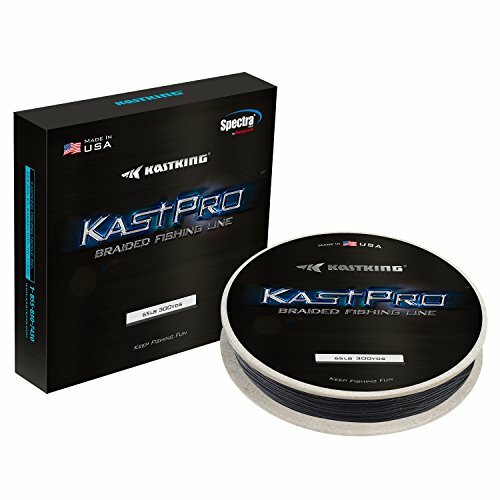 Another pick from KastKing, their KastPro braided line is another affordable choice for anglers on a budget. The KastPro line is made with Spectra fiber, an extremely tough material made to withstand a good amount of abrasion. The compact, braided design is created with KastKing’s signature “diamond weave,” which connects eight separate strands into one thin but mighty line. This particular design was made to handle underwater structures and vegetation with ease. The line is coated with a special color-fast substance that is supposed to keep the pigment from fading over time. It comes in several different colors including pink, green, blue, yellow, and more. The braided design culminates in a round, smooth diameter, which makes casting a breeze. Their diameter is much smaller than the industry standard, which prevents the bulk that is often associated with baitcasting lines. An extra benefit to this line from KastKing is the bio-spool it comes packaged on. Unlike a traditional plastic spool, they are created with wheat straw, which can be composted to biodegrade naturally. With great casting ability and powerful knotting strength, the KastPro braided line is a great choice for anglers who don’t want to break the bank. The main issue with this line is that many users complain it doesn’t live up its advertised strength—so be cautious if you tend to pull in large fish often. 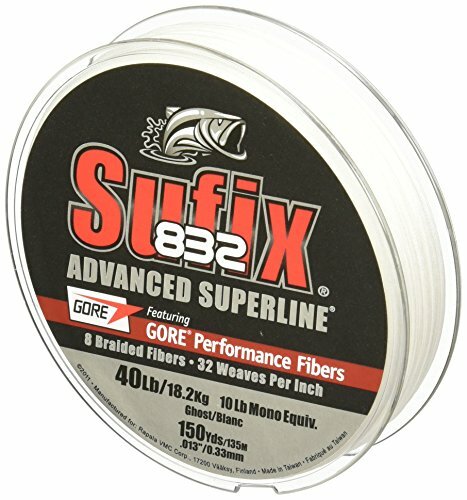 The Sufix 832 Advanced Superline Braid is not for the faint of heart. This is a heavy-duty line sports a thoughtfully created design made for serious anglers. This line is created with eight separate strands, which are braided together in a specialty design made for strength. One strand is made with GORE, a material found in the construction labs of the U.S. military and NASA. It assists in abrasion-resistance, noise reduction, vibration reduction, and also contributes to superior casting lengths. The seven additional strands are made with Dyneema fibers, which are more lightweight and therefore, contribute to the small diameter of the line. Dyneema also provides extra sensitivity and strength. It comes in three different colors, and all feature the signature braid, which features 32 weaves per inch. Sufix also advertises this linen as hydrophobic, which reduces the need for the user to clean the line after each use. Even though the Sufix 832 line is thin, it doesn’t compromise the strength of the product, which is an enviable quality. Overall, this is a powerful tool that almost any angler would be satisfied to have in their tackle box. Though there aren’t a plethora of color choices and, like many braided lines, the color will fade over time, the pros definitely outweigh the cons in this line. The Yo-Zuri line isn’t actually a true monofilament—it’s a hybrid between mono and fluorocarbon. This combination gives the line the advantages of both materials, a feature that many anglers are drawn to. The Yo-Zuri line is a blend of 50 percent fluorocarbon, 50 percent nylon. This gives the line the sensitivity and strength of fluoro while keeping the manageability of a true nylon line. The hybrid is created by molecularly bonding the two materials during extrusion, which results in a dense and durable line. 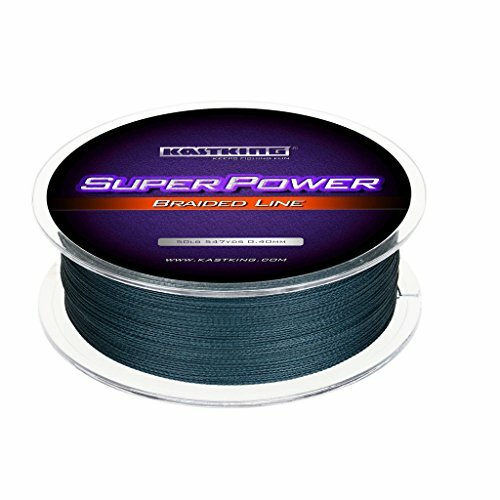 The spool comes with 600 yards of line and features a wide weight range to choose from, starting at a 6-pound weight and reaching all the way to 40-pound. Unlike a traditional monofilament line, the hybrid becomes a little wirier in the construction process. But this density also contributes to added sensitivity. If you’re a fan of both fluorocarbon and monofilament, this line might be the right choice for you. 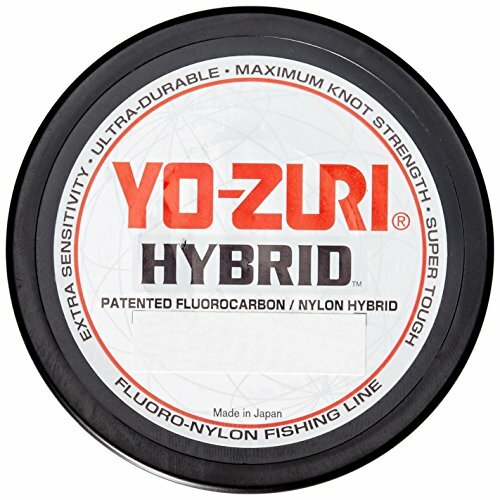 Combining the best of both worlds, the Yo-Zuri hybrid is surprisingly sensitive, yet handles better than a true fluorocarbon would. This line is prone to twist and doesn’t always come thoughtfully spooled, but overall this line is a great value. Reel the line, keeping some tension on it with your thumb and index finger— this will prevent twisting and tangles. Continue filling the spool until it reaches an eighth of an inch from the rim. With some new information at your fingertips, we hope that the style of baitcast angling has become a little less daunting. With some careful consideration of your fishing preferences and skill level, choosing a baitcast line should be simple. Happy fishing!